Dairy farming has been part of agriculture for thousands of years. Dairy cows are adult female cattle cows bred for the ability to produce large quantities of milk, and are usually of the species Bos taurus. There was little distinction between dairy cattle and beef cattle when cattle were first domesticated, with the same stock often being used for both meat and milk production. These days, dairy cows are specialized and many have been bred to produce large quantities of milk, and their production of meat is not as important. In fact, US milk production doubled while the number of dairy cows declined 40 percent between 1959 and 1990. To maintain high milk production, a dairy cow must be bred and produce calves, and dairy cows are rarely kept longer than five years prior to slaughter, even though they live up to 10 years. Hormones are sometimes given to dairy cows to increase reproduction and to increase milk production, but is controversial due to its effects on animal and human health. 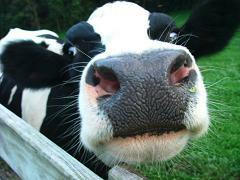 In a lifetime, a good dairy cow will produce about 200,000 glasses of milk. Why Is Wisconsin Called America’s Dairyland and How Much Dairy Does the State of Wisconsin Produce?